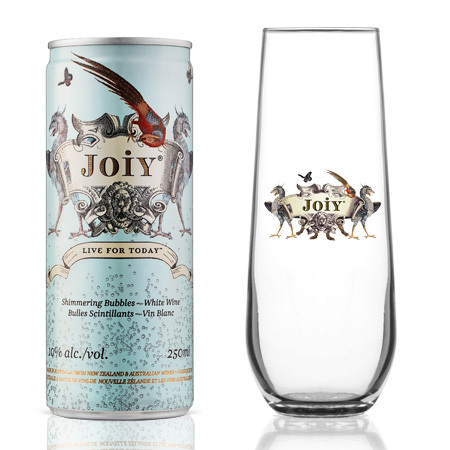 Make Your Summer Sparkling With JOIY One-of-a-kind Joiy is now available in a convenient single serve can, perfect for picnics, barbecues and beach days. Chic, aromatic and spirited, Joiy is inspired by natural beauty with no added sugar, concentrates or flavours. It’s the ultimate guilt-free celebration drink. With the warm weather upon us, there’s no better time to enjoy the prosecco-style wine, whether it is alone or in a fresh wine cocktail. This easy-to-drink bubbly is a blend of aromatic grapes form the cool climates of New Zealand and Australia. Joiy Custom Glasses Are Here! Purchase Your Customized 8.5oz JOIY Stemless Wine Glass today. Add your name or a message for free! Simply fill out the form below and a customer service representative will contact you! Decide on whether you would like your wine glass with only a JOIY logo OR if you would like to customize at no extra charge! Choose from 3 fonts of which you can create a name or a message up to 50 characters. Make sure you fill out all of the proper information and as many details as you can. We will complete your order through a customer service rep so don't worry if you are unsure of something. Payment will be made through Zenan Glass.